065. ENDURANCE SUNK BY ICE. Issued by Brooke Bond Oxo Ltd. (1973). 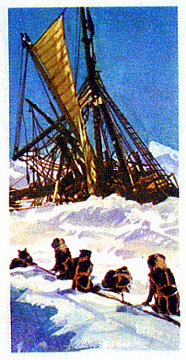 Card number 36 from a set of 50 entitled "Adventurers & Explorers". Size: 2.7" x 1.42". Recto: View of Endurance being crushed, with dog team in foreground. Based on a Hurley photograph.